The aim of this guide is to help advanced eCommerce store owners understand the importance of utilizing Facebook to grow their businesses and to show them exactly how to do it. We wanted to expand on this and make a comprehensive guide. We can almost certainly say that every store owner heard about Facebook at some point. Most of them are using it on a daily basis. However, there is still a huge number of them that don’t understand the power and importance of Facebook in business. Facebook very often collects scary amount of data about its users. Besides data you provide by using their site they also track your interests and behaviors using plug-ins on other websites and services where you might log in using Facebook credentials. That is why it’s so powerful. It’s important to understand that this is good news for store owners. You now have better tools for advertising and can more easily and effectively target your potential and existing customers. Even though Facebook advertising platform is fairly new it is equipped to support your business every step of the way. It can help start your business, help you increase and manage your customer base, give you great feedbacks and finally give you tools for managing customer retention. This is a place for your business on Facebook. You will spend most of your time engaging your fans there. Managing your Facebook fan page is managing your online reputation so take good care of it. You will use this page to run all your ads. Most of you already have a fan page. It’s important to get everything right before inviting users to like your page or engaging them in any way on Facebook. If you don’t have a fan page follow these steps, and if you do, continue reading just to make sure you’ve done all the necessary steps. First you need to visit facebook.com/pages/create. On the next screen you will have a few choices. These are all types of fan pages. We highly recommend choosing Brand or Product as it gives you the most features that will be useful in future. This will lead you to a set up process. You will need to choose a profile picture, write a short description of your business, provide website URL and choose your fan page URL (make it as relevant and descriptive as possible). At this point you will have created and published Facebook fan page. Do not invite users yet! Your fan page still isn’t ready for users. Edit your page to include additional business information like phone numbers, location, working hours, etc. Write and publish your welcome status. You can also add more posts so your users can see some content there. Add a few pictures. Also, adding a few milestones like the month when the company is founded, moving to a new office or any other important moment in your history would probably be interesting information to share. Upload your cover photo. This is the first thing user sees when landing on your fan page. Choose your cover photo with caution. Dimensions are 851 px x 315 px. There are many different uses of this element and you may alter between them. You can show off your products or services, promote a giveaway, post fun facts in relation to your product or service, support a cause if you and your fans are really passionate about it, etc. You can see a longer list in this article about cover photos. When all these steps are completed your fan page should be ready for users. It has important business information, attractive cover photo and engaging content. This is a good place to get some quick and easy fans. There are a few things you can do to get a few dozens or hundreds of fans depending on your existing customer base and Facebook friends. Invite your friends to like your page. Inside your fan page’s admin panel you will find an invite feature. In a few clicks you can send an invitation to all your friends. It’s assumed that a good portion of your friends share your interests and therefore might like your page and business. A good amount of them probably bought a thing or two from your store. Send an email to your current customers to notify them about your new Facebook fan page and invite them to join you in a conversation there. Most of them will be happy to have another platform to comment on your products and services, find likeminded people and have fun. If you have already invested some effort in other social networks it can’t hurt to invite your followers, friends and connections to like your fan page. This will surely boost your fan numbers. This is without a doubt the most important step. Everyone have heard that content is the king. It is no different for Facebook. Your content should be rich, helpful, educational and positive. There isn’t a magic formula of content that will work 100% of the time. 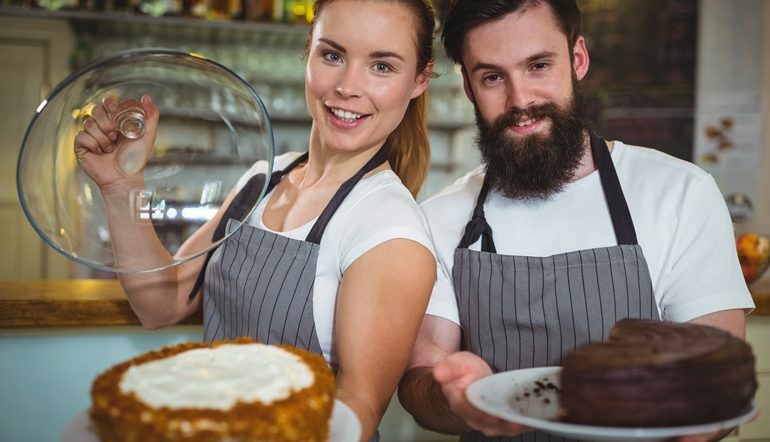 You already know what your customers need and want so start giving it to them. If your business is still new, start engaging your current customers and they will tell you what they like. Share a variety of content. Images are always great attention grabbers. Ask your users for a feedback. Create a poll about which features they would like to have in a new version of your product or service. Ask them if they like your new design or if you should tweak it more. Showcase your new products or show them what products you use. Make a “behind the scene” video or interview your employee. Ask them to make a picture of themselves with your products. Possibilities are endless. As long as it’s not a monolog, you should have a positive experience. You do all this by using two Facebook features; posting and sharing. Posting is a primary way to communicate with your fans. It allows you to write a status, insert a picture, create a poll and many other things we already mentioned. The post you write will be displayed on your page wall and available for all visitors to see. They can also engage with your post by a like, share or a comment feature. Keep in mind that your fans can also post on your wall. They will often comment on your products, services, customer service, etc. They will also often ask you different questions. None of these should go unanswered. Create a great content and communicate so you give them a reason to check your page often. Sharing is a great feature to showcase a great content from some other source or author. If you see something that you like and it’s related to your business, feel free to share with your fans. Also, when users gives you a great review in your comment section feel free to share it so everyone can see it as it is now a first thing on your wall. Don’t let great reviews be unnoticed. Focus on your news feed. Majority of your fans will see your posts in their news feeds. Be sure to adjust your posts so they look good there. Some of fans’ posts will automatically move to “Hidden” section. Be sure to check there often so you can move this content back to your wall. With a great content on your wall you can now use a few tricks to increase the number of fans even more. Use Facebook plug-ins on your website to invite users to like you on Facebook. Also, you can give different incentives and use different calls to action in you transactional emails to get more fans. Once you have a good amount of quality content and fair amount of happy and loyal fans it is time to step up your game. Now you can be comfortable to invest in your page. Keep in mind that you are still promoting your content and not products. In this phase you want to additionally build you fan base. You will do that by promoting your posts. Now all the effort you invested in great content pays off. The first thing you should do is create a Facebook advertising account. 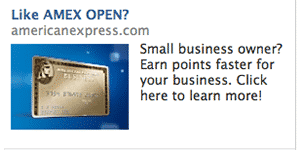 Go to facebook.com/advertising and click on a green button “Manage your adverts”. There is a link on a left hand side that says “Settings”. Go there, give your account a name and fill in all other information. Now that you have your advertising account and your fan page is ready you can promote some of your posts. Since you are spending money here try choosing the best content to promote. Good indication would be a high number of comments and shares. If you choose wisely you could get a big boost in the number of fans for a very small cost. Visit facebook.com/ads/create. Choose a “Page post engagement” and make sure you correctly pick the right page and post if you manage multiple ones. 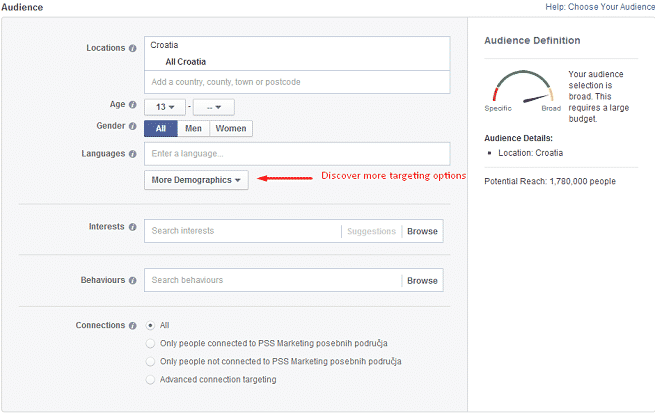 Demographics – in this section there is a ton of targeting features available. Everything from location, age, gender, languages, interested in (male, female, both), relationship status, education level, fields of study, specific schools, graduation years, employers, job titles, industries, ethnic affinity, generations (baby boomers), parents with kids at certain age, political affiliation and different life events. Connections – target users with specific type of connection to your page. You can choose only people connected to your page, event or app, not connected to them, friends of people connected to them or a combination of those options. Choose appropriate budget and bidding option. There are three different options to choose from. Our suggestion is to choose bidding for clicks and apply 3x higher max bid per click than suggested, courtesy of Ezra Firestone. If you want to promote certain post to only a portion of your fan base try using unpublished posts. This is a feature that gives you the ability to promote a post without publishing it on your wall. This way you can avoid showing your promotions for fans that are not relevant. There is a great guide on how to use this feature on AdEsspreso. By this point you have a serious number of fans that are engaging with your content. After a few weeks of engagement you are ready to start promoting your products to them. This is the approach that many expert marketers use because it works. You will often see some purchases from Facebook fans before you even start advertising your products. That is a little bonus you can enjoy since the aim so far wasn’t so sell at all. This means you are on the right track. But don’t be discouraged if you don’t sell by this point. Your foundation is set. Now, before you dig into creating quality ads you should ensure you are tracking your advertising efforts. It is very important that you know exactly how much return is attributed to your ads. You will do this by tracking conversions. Conversions are desired actions by your visitor. Most probably it is a purchase. You can have a multiple conversion points on your site. For example, it can be a newsletter opt in, pdf download, submitted enquiry, etc. If you want to track more than one conversion type you will need to create a separate conversion tracking pixel for each one. We recommend that you only track a conversion that directly generates money – a purchase. Other conversion you can track using Google Analytics or some similar tool. 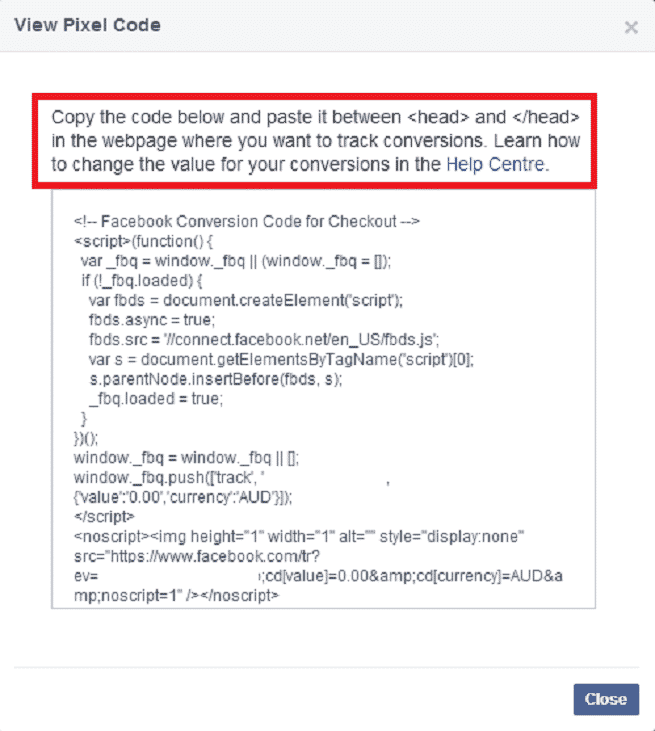 To create a conversion tracking pixel navigate to facebook.com/ads/manage. Click the “Conversion tracking” on the left hand side of the screen. 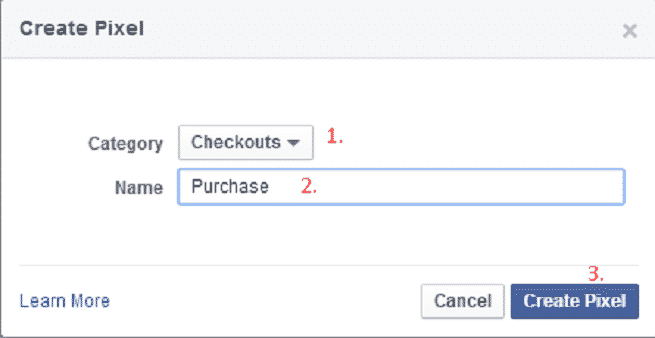 Create a tracking pixel, choose a category (usually a checkout) and name it. This will generate a code snippet. Copy it and send it to your developer along with these instructions. You want this code on a checkout or a thank you page. After verifying your conversion tracking pixel is in the right place you can go ahead and start creating ads. Those ads will lead directly to your product pages. Some experienced marketers say that you shouldn’t advertise more than one product at a time but if you have large enough fan base then you can separate different people for different products or services. To create ads you should follow similar steps to post promotions but instead clicking on “Page post engagement” you would click on “Website Conversions”, choose a conversion type and go from there. In targeting section you will have some additional options that we will explain shortly. Creating good ads requires an understanding of an audience you are targeting. You should always tailor your messaging specifically for each segment of your audience (male, female, younger, older, parents, teens, returning customers, etc.). We can conclude that there is no secret formula since every segment is different but there are some best practices that you should follow. The most important thing in Facebook ads are offers. This is probably the only element of your ad that is a deal-breaker. If your ad doesn’t have an offer it just won’t work. Offer a discount code, 30% off, 2 in 1, give something for free, etc. When you have a good offer then it is easy to create an eye catching headline which is a very important part of your ad. Another eye catching part of your ad is an image. Make sure product or people in your images aren’t too small. Place almost no text on your image. Your logo should be enough. Quick tip: an image of a smiling woman often gives most clicks. The description place in your ad is a place where you should state your value proposition, create urgency, include business name and call to action. It seems like a lot of thing to put in such limited number of characters but with a little imagination and creativity it can certainly be done. The first ad gives us an example of a bad image. Would you say that this image represents advertised services well? No. It is very unclear what is happening to that person. So remember, even with a good headline and description your image can ruin it all. The second ad gives us an example of generalization. It does not provide a clear reason why anyone should click the ad. It doesn’t tell us what this app is about and how we could benefit from it. Both of these ads have good headlines (left – question, right – brand reinforcement), clearly stated benefits and calls to action. Both images are highly relevant and it’s clear what those ads are about. This is a good place to talk about mind boggling advanced targeting methods Facebook provides. You can combine these with standard targeting method previously explained if you need more detailed segmenting. For this step we will explain two of the advanced methods. Custom audience is an audience that you’ve imported from another source. Other sources can be your newsletter list, CRM system or any other lead base. By uploading your emails to Facebook, it will search their database and find Facebook users with those emails. This will be your custom audience. You can also upload a list of Facebook user IDs if you’ve scrapped them using a number of different tools like Social Lead Freak. 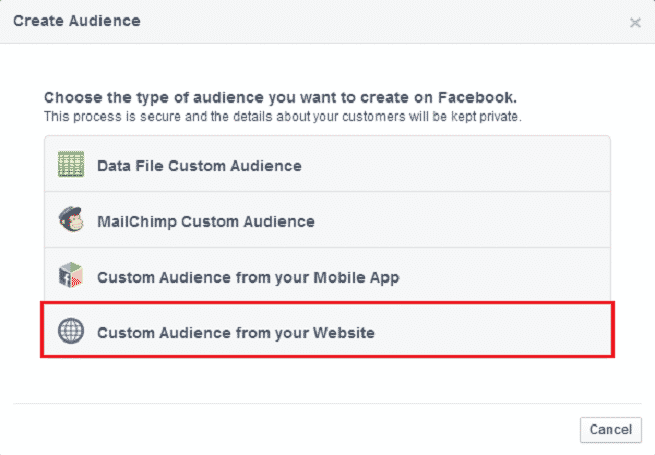 To create a custom audience, go to facebook.com/ads/manage. Click on “Audiences” on the left hand side of the screen. Click on the “Create audience” button and then on “Custom audience”. You can import your emails, phone numbers or IDs from an Excel file, MailChimp, remarketing list or app user IDs. You should have at least 1000 people in your custom audience to have a significant reach. Lookalike audience is an audience that is very similar to your desired audience. This can be a custom audience or any combination of different targeting methods. In order for a user to be a part of a lookalike audience it has to have a six common points with your custom audience. 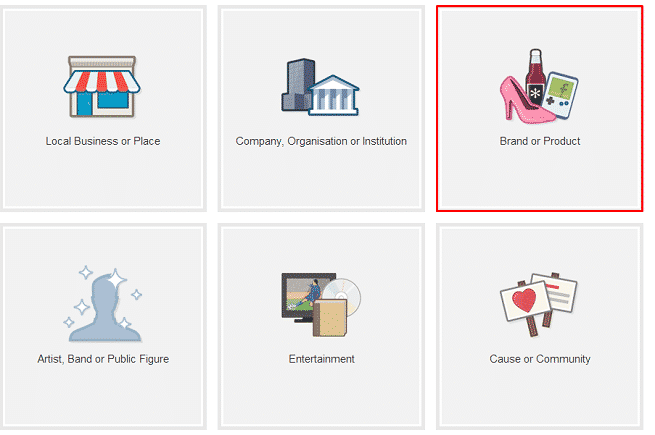 You can create lookalike audience by clicking a “Create Audience” button and then clicking the “Lookalike Audience”. 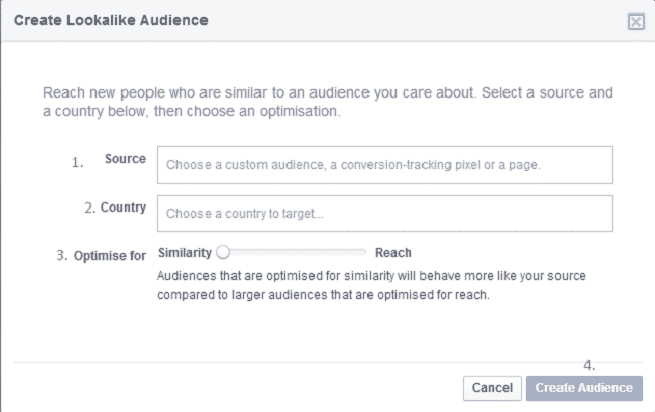 This will lead you to a screen where you can choose a source audience on which Facebook will model lookalikes, choose a country and the level of similarity vs reach. We recommend going for maximum similarity since it gives you the best chance of a positive ROI. If we have to point at the best feature on Facebook it would be this. Facebook will find you as many people as it can that are very similar to people that already bought from you (assuming you are creating lookalikes of people from your transaction history). This puts you in front of a large number of users that never engaged with you but you still have a high chance of converting them into customers. This is nothing short of amazing. You are now managing a very successful Facebook campaign, getting a high number of purchases and growing your business. It is a good time to invest some effort into reengaging with your customers and potentially getting them to buy again. In this phase, Facebook can help you in two ways – continue posting awesome content and engaging with your fans, and start doing remarketing. 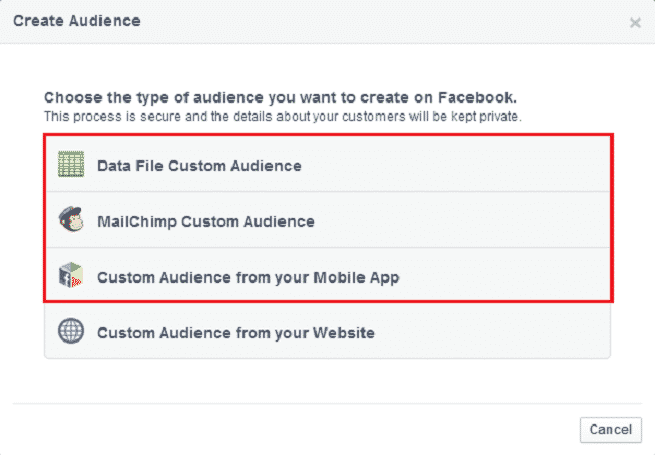 By placing another code snippet on pages on your site, Facebook will give you an option to target all your visitors. This doesn’t mean only those who made a conversion but all visitors. This gives you a chance to convert those who didn’t convert before or to periodically incentivize regular buyers, upsell, cross-sell, etc. 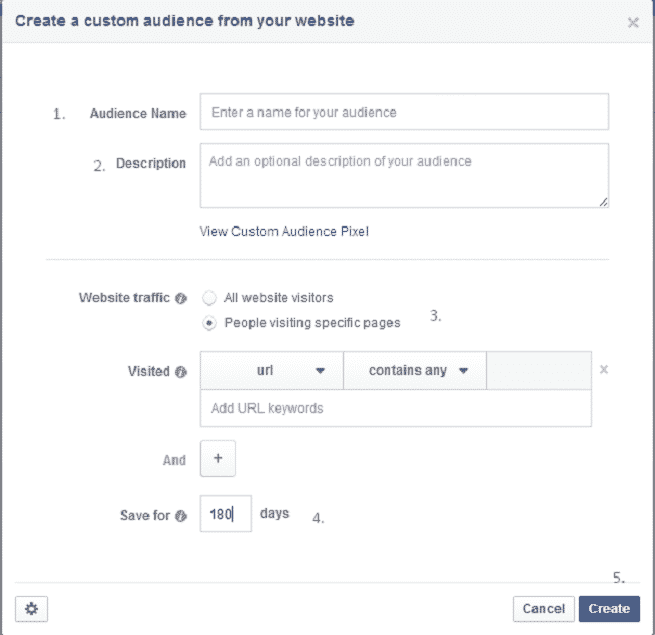 To create a remarketing audience you would go to an “Audience” section of your Facebook manager interface. Remarketing audience is essentially a custom audience, so you can follow process already explained. Once your developer applied the pixel on all your pages you won’t need to do that again for every remarketing audience you create. After clicking on “Create audience” you are left with a few options. First name your audience and give a description so you can refer to it later. Now you can choose whether you would like to create audience with all your visitors or only visitors of a certain page. This depends on your campaigns goals. Understand the use of remarketing before creating any audiences or ads. We recommend increasing your retention window to a maximum of 180 days. Again, it depends on the campaign goals. You will then follow the process of creating ads from previous step and target them to newly created audiences. Be sure to create tailored ads for every single remarketing audience you create. Following the above process will help you to make the most from Facebook. You need this how-to guide to understand and start utilizing Facebook as an important source of your business activity. Facebook can help you develop your business from getting your first customers to managing their retention.